My kids school, like many kids schools, has a yearly auction to raise money for the PTA. Since I am not much of an auction goer I opt to help out by making stuff, preferably stuff that involves the kids or school in some way. Last year I made a Hang Ten Jacket using fabric my daughters 1st grade class designed using nature objects and negative print making. This year I introduced her 2nd grade class to ice dying for Ice Week. With the guidance of Beth Mastrudeh we devised a way to do the dying safely in the classroom by premixing the dye with water and freezing it instead of dusting the dye on top of the ice cubes. It created a bit of a different effect but was equally lovely and safe to demonstrate to the kids. At the end of Ice Week after the kids had been studying how ice works I came to visit the class. I gave a little talk on dying fabric before they watched as the ice cubes melted and mixed dying they fabric before there eyes. The kids had lots of great questions and were excited to see the fabric once the ice had all melted. At the end of the day I took the fabric home, washed it and then took it to the studio to be turned into handbags. The fabric became two handbags, one fold-over clutch with a leather asymmetric bottom and the second a rectangular clutch with leather strap. Ready for the auction! Like some of the tutorials I’ve done but don’t want to dig back in the blog to find them? Well I am currently working on making them available as pdf downloads on my etsy site. Available so far Doll Dress Tutorial, Lace Earrings Tutorial, Coffee Cup Sleeve Tutorial, Breast Pad Tutorial and Two in One Dress/Skirt Tutorial. More to come as I manage to go through the archives and get blog posts converted to useable pdf documents. Tomorrow is my first popup shop in the studio! Terribly last minute, it was last weekend the I realized the month was almost done a we hadn’t done our monthly popup. After a quick check to see if anyone else was interested, Ed and I landed on tomorrow (March 25) as the day. Needless to say I have spent the last week frantically trying to build some amount of stock to have on had and forgot to properly advertise. Here hoping I’m not the only one there. I was really hoping to make this post much earlier but my summer got away on me. Better late then never, here is the dress/skirt tutorial I put together this summer. This is a super easy to draft and sew tutorial for a for a dress you can wear as a skirt or a skirt you can wear as a dress. 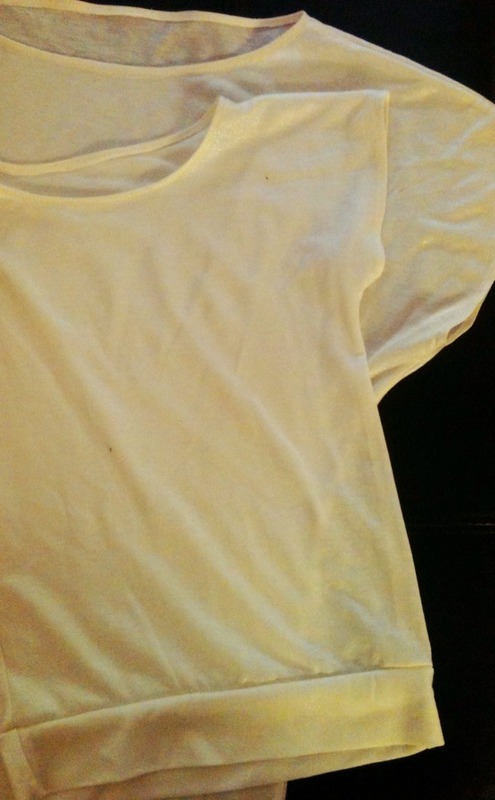 Either way I found it a versatile piece I’ve worn everywhere from the beach to date night to my daughters gym class. Enjoy! I am making progress! Even if I haven’t managed to get my tutorial out yet (just need to finish testing). The next set of patterns are graded and are staring testing so here is a sneak peek at the Parkette Top and Mini Me Parkette Top. The Parkette Top is based on the Park Top but with shorter sleeves and clean finish neckline and the Mini Me version will fit sizes 3 months to kids size 8. So with out further ado, a quick pic of the first sample. I am working on some new stuff! First up is a Two in One Dress/Skirt tutorial, perfect for warm weather. I am also expanding the Park Top family with two new styles; Parkette and Angel Wing Parkette. Based on the Park Top they share the same fit but with shorter sleeves. To make it even more fun I’m releasing Mini Me versions for kids too. Ok may not nessesarily yellow polk-dot but it could be. The Incy Wincy Bikini pattern was release yesterday. Incy Wincy Bikini is a 5 piece set which includes both fitted and gathered triangle string tops, bandeau top and low riding bottoms in regular and sway-back for slightly more coverage. Pick your fabric, pick your style and look great poolside. At long last I managed to get photos taken, the notes page done and it ready for release. Althought my paterns assume you have sewn before, I did included notes about sewing swimwear covering a bit about fabric, stretch, elastic and equipment. 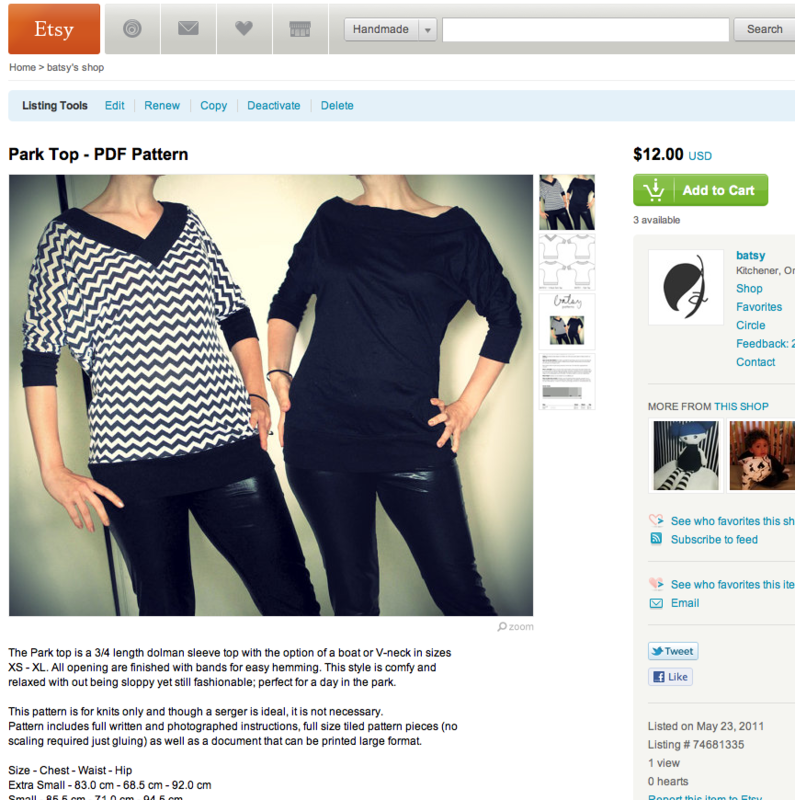 The Park Top is now available on Etsy! Congratulations to the Spring Top Winners and Runners Up!